Fashionable Fabrics is an on-line fabric store started in 2004 in order to provide an amazing group of designer and designer novelty fabrics in one location. The owners are passionate about fabric and have a terrific selection. To see a list of current collections and designer fabrics available click here and here. For one entry leave a comment on this post mentioning your favorite item/collection over at Fashionable Fabrics. For another entry sign up for their newsletter...then come back and leave a comment (their newsletter sign-up is on the left side bar at their site). 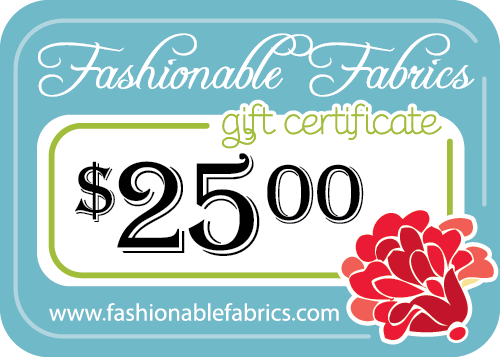 For a third way to enter, "Like" Fashionable Fabrics on Facebook...then come back and leave a comment! I'll keep the giveaway open until Friday, August 10th. Good luck, and thanks for stopping by! I think the Costume Clubhouse is so adorable. Having 4 boys, I am so in love with Peak Hour. I would have loved to have this when they were younger! I like the Henry Glass Frightful Pumpkins in purple. I need to start my fall sewing! It's coming up quickly! I like the Sew Cherry Collection by Lori Holt/Riley Blake Fabrics. I like the ombré dots by Riley Blake. My current fave is Gypsy Caravan by Amy Butler! Thanks for the opportunity. What a fun giveaway. I haven't seen this site before visiting you. I love Sew Cherry line. ALREADY 'LIKE' FASHIONABLE FABRICS ON FB! HELLO! MY FAVORITE COLLECTION IS 'OMBRE DOTS'! SIGNED UP FOR FF NEWSLETTER! I love Freshcut by Heather Bailey. Ohhh, I love Amy Butler's Gypsy Caravan stuff. Yummy yummy. I like the Next Stop London in white from Laurie Wisbrun. I could choose many more, but that is a definite must have. I think the remnants are my favorite. My stash was built on remnants! Thanks. I know it sounds silly but the Paddington Travels-Countries as I have been collecting bits of paddy and this would be so cool to add to it. I signed up for their newsletter, too - now I'm in trouble. There are so many great fabrics there, but I still love Salt Air! I also signed up for the newsletter. Thanks for the great giveaway! Love the remnant section! Thanks for the chance! I like the ice cream you scream stripes in pink. It would make a good binding. I still love the Riley Blake Chevrons...loving them from afar at the moment! I just love Flea Market Fancy, I would love to add some to my stash. Thank you! Just love the "From the Hip"Alexander Henry Fabrics!! Salt Air is one of my favorites. I've liked Fashionable Fabrics on Facebook. Wow so many wonderful fabrics, choosing one is proving to be quite difficult! Today I'll say Salt Air, but tomorrow it may be something entirely different! LOL Thanks for the fun! I love the Sew Cherry by Riley Blake. There is so much to love! If I had to choose only one, I would choose Apple of My Eye by Riley Blake. I love their selection of Andalucia by Patty Young. I love the Just Hanging so bright by Alexanderthe Henry. Adorable! I like the freshcut by Heather Bailey. I like FF on FB! I love the prints in the Crabtastic line. I guess I'm thinking beach right now. Thanks for introducing me to another great store! I love Anne Kelle fabrics, and what great prices she has them for. La Paloma is on my "must have" list! Currently receiving their newsletter :). Love them! I like the Fruit Slice collection at Fashionable Fabrics! Sherri, I love the flea market fancy in yellow. Ooooh, Freshcut by Heather Bailey definitely! Robert Kaufmann : the lion heads. I signed up for there newsletterThey have good shipping rates to Europe. I love their selection (and price) for Costume Clubhouse! Great selection of Novelty fabrics love Where's my Stache and Keep Calm! I like Fashionable Fabrics on Facebook. I like FF on FB!! Thanks for the chance to win!! I like Half Moon Modern by Moda - especially the scissor print. Thanks for the info on a new fabric source, and for the chance to win! Although I kinda got lost in fabric love over there, I found Sew Cherry by Riley Blake and fell head over heals in love. I follow Fashionable Fabrics on Facebook. Still love Flea Market Fancy and almost anything by Dear Stella. Thinking Holidays right now so 12 Joys of Christmas or Hip Hip Holidays would have to be my favorites. Thanks for the chance to win. And I already like them on Facebook. Thanks for the giveaway. My favorite collection is backyard baby. My current favorite fabric that Fashionable Fabrics has is Salt Air Sea Garden in Ocean Blue by Cosmo Cricket! And I already like FF on FB. That's how I found out about the giveaway! One of my favorites is Delighted (Riley Blake). liked them on FB! Thanks. I love the ombre dots in grey - gorgeous! Okay, so there really isn't one thing over at Fashionable Fabrics that I like best. I will tell you what I love. I love the selection of everything. The fabrics are adorable and there are so many that I would love to have. I also love the flat rate shipping. I can't tell you how many times I have gone to order something, but the inflated shipping ends up killing it for me. this is too hard. I have to choose just one line? I love them all, but I love gypsy caravan by amy butler! I like the Hello Luscious by Basic Grey! I liked Fashionable Fabrics on FB! I really like the Roar Lion Heads in Burmuda by Robert Kaufman Fabrics. I "liked" FF on facebook. I do enjoy seeing the reminders when checking fb. I think I'd like to get some Little Apples or Half Moon Modern! I always go for polka dots!! I love the Ta Dot Lime and Dumb Dot Gray by Michael Miller. It was hard to just pick one as a favorite. There is so much wonderful fabric out there. But if I did have to chose one, I think it would be Ten Little Things collection. Oh boy. :o) If I were to win, I would love to purchase the Trailer Travel by Michael Miller. I absolutely love it!! :o) Thanks for such a fun give a way! I love the sherry berry halloween fabrics. My next purchase from them will probably include Lush Twirling Blossoms in Sky by Patty Young and lots of lovelies from Michael Miller! I really like the Lush collection by Patty Young. Beautiful! My Mind's Eye by Riley Blake is my favorite. Love the elephants! I like Costume Clubhouse Web in all the colors. My fav is Salt Air by Cosmo Cricket! Love the flat rate shipping. I love most things Riley Blake, lol. I love the pretty pink floral ming ying!! !it would go so nicely w planned quilts for the grands. I love the Where's My Stash fabric. Thanks for the great giveaway. I like Hello Luscious by Basic Grey the best. Thanks for the great giveaway. I love the Roar Collection from Robert Kaufman! I like Fashionable Fabrics on Facebook! I signed up for the Fashionable Fabrics newsletter! I like the Sew Cherry line and many other fabrics. I really like the Heather Bailey fabrics! I'm signed up for the newsletter! Sherbert Pips Scoot or any of the Japanese fabrics! I still love Nicey Jane by Heather Bailey. I wish it would get re-released, but I am so happy to find some of it at Fashionable Fabrics. Riley Blake's Chevron prints and Ombre Dots have been on my wish list for a while! From fashionable fabrics shop, I like Aviary 2 by Joel Dewberry among many other collections. Spooktacular Too is just so cute !!! I am now signed up for their newsletter. I already "Like" Fashionable Fabrics on Facebook. My favorite collection at Fashionable Fabrics is Pat Bravo's Spellbound. I'm signed up for the Fashionable Fabrics newsletter. Thanks for a great giveaway! I'm already signed up for their newsletter. I like Fashionable Fabrics on FB. I follow Fashionable Fabrics on FB. I am always drawn to Plain Jane aqua and red! Love those colors together! I like Parisville by Michael Miller! I subscribe to the fashionable fabrics newsletter. I like Flurry by Kate Spain. Thanks for the chance! I love the Sew Cherry collection. Thanks for the chance! Wow on the first page I found a favorite that I need--Ooh LaLa red by Pillow and Maxfield. Thanks for the opportunity. Right now I don't have a favorite, I just want to start a collection of "texts" fabrics. Love, love, love, love, LOVE 2D zoo! Where has it been all my life? I like Aviary 2 fabric. I like FF on FB as Peggy Gibbs. I love the Fly a Kite Collection.